This person does not exist – that name is part of the fraud! 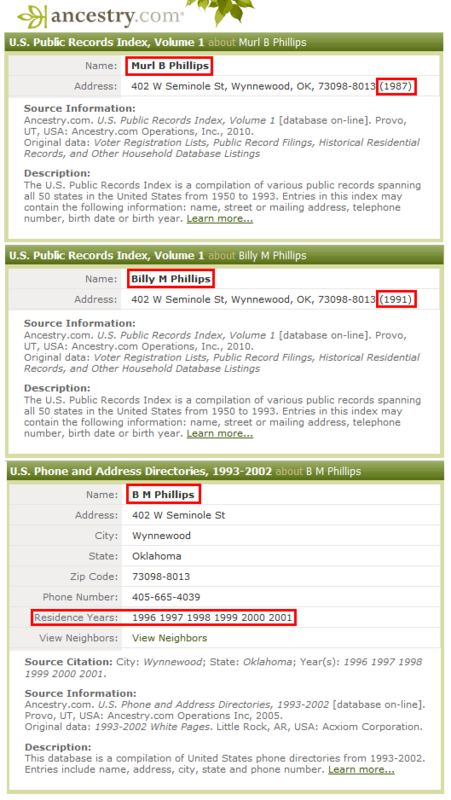 Specifically, Bill Dalton Phillips or William Dalton Phillips of Wynnewood, Oklahoma does not exist. There is mention of a man by that name in an 1894 issue of the San Francisco Chronicle, but the man responsible for the hoax was born in 1929 in Elmore City, Oklahoma and this is one of several aliases he assumed in order to perpetuate the hoax (click here to see the aliases we know about). The legal given name of the man responsible for most or all of the known disinformation is Billy Murl Phillips. In 1987 the National Association for Outlaw and Lawmen History (NOLA) published an article submitted by "Bill Dalton Phillips" (one of his false names). It is a wildly creative tale of how his grandmother was a daughter of Lewis and Adeline Dalton and how they were "visited a number of times by her outlaw brothers and other gang members". In March of 1987 he filed for an amended death certificate for his father, Jack Phillips, changing the maiden name of his mother (Bea Elizabeth PHILLIPS) from HARRISON to DALTON. His grandmother, Bea Elizabeth PHILLPS, had no death certificate, as they were not issued intil more than two decades after she died in 1894. But, in April 1987, he filed a "delayed filing" death certificate for her, and had it give her parents as James Lewis DALTON and Adeline Lee YOUNGER. Also in 1987 he sent information to author Mark S. Pannill claiming to be related to the DALTON family and included photocopies of documents, some of which are included elsewhere in this exposé (referenced where used). In late 1987 and early 1988 he "replaced" several tombstones claiming they had been stolen. See Lies Carved in Stone. He moved the tombstone of his grandparents, Thomas and Elizabeth Phillips, adding an inscription that Elizabeth was the "daughter of James Lewis and Adaline Dalton". He placed this tombstone in the Elmore City Cemetery when they were buried in the Tussy Cemetery (the Elmore Cemetery is more public). He also replaced the headstone in the Tussy Cemetery with one containing a similar epitath. He "replaced" the tombstone of Adeline (Younger) DALTON to which he added a list of her children and including his grandmother "Elizabeth" (which does not agree with any available evidence). He added his name to the bottom of Emmett Dalton's tombstone claiming he is a "great-nephew" (sic - grand-nephew). Neither Leona or Simon Dalton had a headstone, so he had one installed for each of them. On the reverse of Leona's "new" headstone is a list of her siblings along with the fraudulent "Bea Elizabeth Dalton Phillips." Sometime before 1992 he sent similar information to author Nancy Samuelson which she included in her book "The Dalton Gang Story: Lawmen to Outlaws" (ISBN 0963336207) (referenced where used). 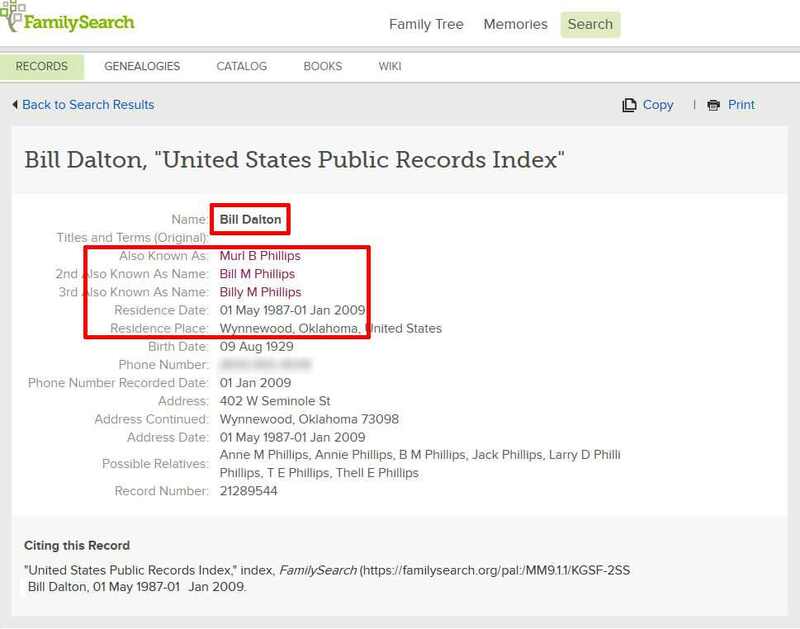 In 1996, two DALTON researchers copied information, apparently from the Broderbund Archives, which showed that Bea Elizabeth Phillips' maiden name was DALTON and that she first married a HARRISON and then Tom PHILLIPS. Both researchers later determined there was no proof of those facts and removed them from their records, but they ended up in ancestry.com's U.S. and International Marriage Records, 1560-1900 which numerous researcers cite as "proof". 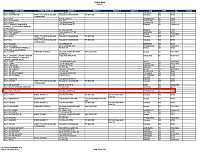 The origin and date of this data is unknown but it is likely Bill Phillips. His first cousin, Lee Phillips, died in 1998 and there are two versions of his obituary. The first, published in Lee's home town, has no mention of a DALTON connection but the second, published a full month later in Bill's hometown newspaper, the Wynnewood Gazette, now giving Lee's mother (Bill's grandmother) as Bea Elizabeth Dalton Phillips and a false family genealogy tracing Lee's ancestry to James and Adeline Dalton. In 2001 he sent to the Dalton Genealogical Society (DGS) a "Memorial Obituary" for Leona Dalton into which he inserted his father's name. Of course, he gives no source for what he submitted and the real obituary for Leona makes no mention of his father or any other PHILLIPS. Billy Murl Phillips sent family pictures of himself, his parents and siblings along with other documents to DALTON researcher and author Nancy B. Samuelson in which he continues to promote his audacious falsehoods. Unfortunately, she published them in her book The Dalton Gang Story. 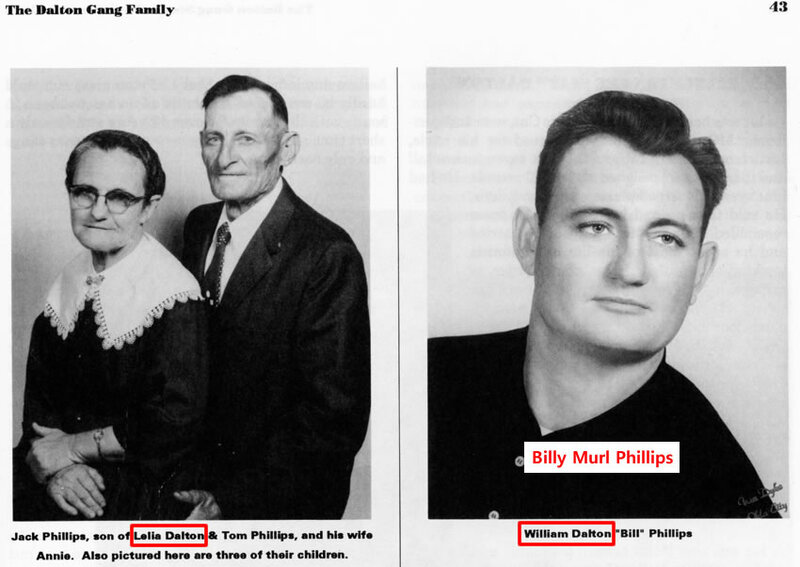 Not missing an opportunity to promote his deception, Billy Murl Phillips adds more "proof" of his relation to the Dalton Gang by saying his father was the son of "Lelia Dalton" and that his name is "William Dalton Phillips". Of course, Bea Phillips never used the name "Lelia", his father is not related to the Daltons and his name is neither William or Dalton. He continues his falsehoods by giving himself the name of William Dalton Phillips of 402 W. Seminole in Wynnewood. This is another of his lies. He was born Billy Murl Phillips. He attended school by that name. 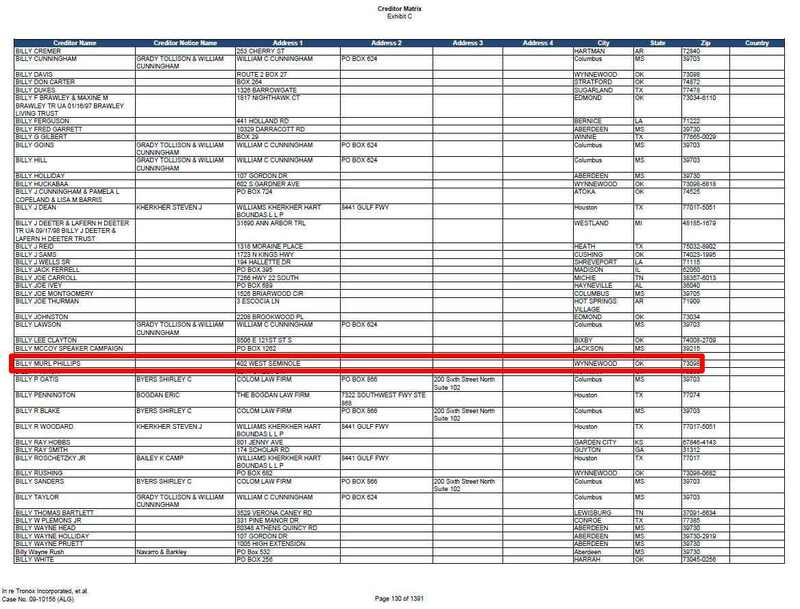 He receives mail and utility bills in that name and is listed on city directories under that name. 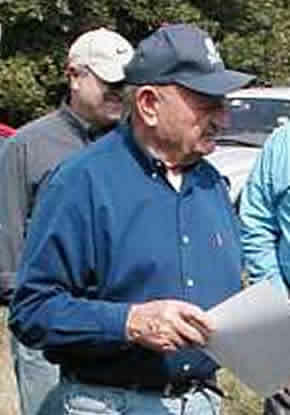 This picture is from the "This & That Newsletter" of Oct. 2005 at OklahomaHistory.net and shows him at his true age. The description reads: "Here are a couple of group pictures I took when we are SW of Pooleville, Oklahoma at the site Bill Dalton was killed. The man with the blue shirt and ball cap is Bill Dalton Phillips of Wynnewood, Oklahoma (but Bill Dalton Phillips does not exist). He is a descendant of Bill Dalton (no, he's not) and keeps the place mowed etc., and furnished the US flag that marks the spot."